The NHL is one of the most exciting sports to watch. The game is fast, the goals are furious, and the fights are ferocious! In fact, fighting has become such a staple in hockey that refs don’t break them up right away. Players are allowed to throw their helmets off and swing wildly at each other. In fact, jerseys are now specially designed so they cannot be pulled over a players head during a fight. Stats are even kept for each player and how many fights they have been in! Basically, fans love hockey fights. 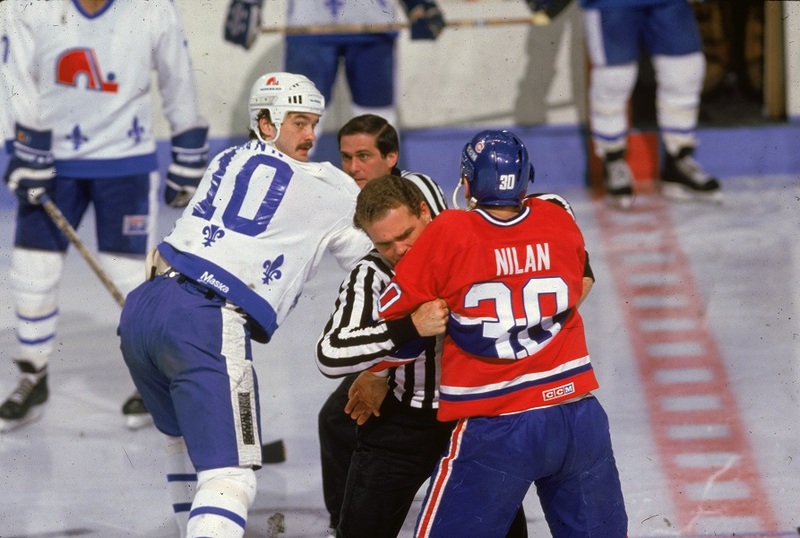 With that in mind, we know you will love this list of the best NHL fights of all time. You’ll never believe who took down Wayne Gretzky with one punch! Marty McSorley is widely considered one of the dirtiest players of all time. During his career, he found himself in a number of brawls. None more entertaining this one. 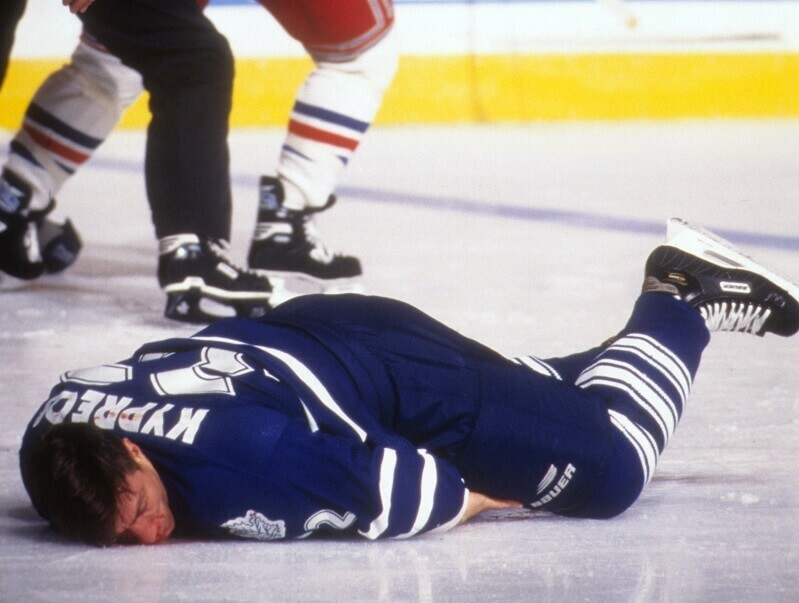 His sights set on Toronto Maple Leaf Doug Gilmour during the playoffs, McSorley laid down a brutal hit on the defenseless player. 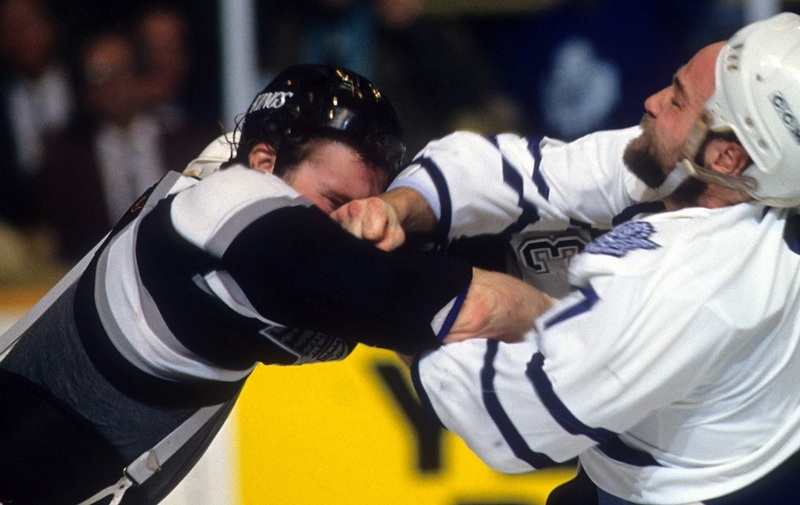 With their best player down and their playoffs hopes dead, Wendel Clark did what good teammates do, got into a fight. Despite being incredibly undersized, Clark threw his helmet down and unloaded a fury of right hooks on McSorley. The refs let the fight go on until Clark pulled his opponent’s jersey off. This one was truly a fight for the ages! During game three of the 2004 Stanley Cup Finals, the Vincent Lecavalier changed the momentum of the series after taking down Jarome Iginla. The lifeless Tampa Bay Lightning looked like kindling for the Calgary Flames. The games were ugly and the scored were even worse. During the series-changing third game, Lecavalier got tired of Iginla’s aggressive checking on the boards and tossed down his gloves. 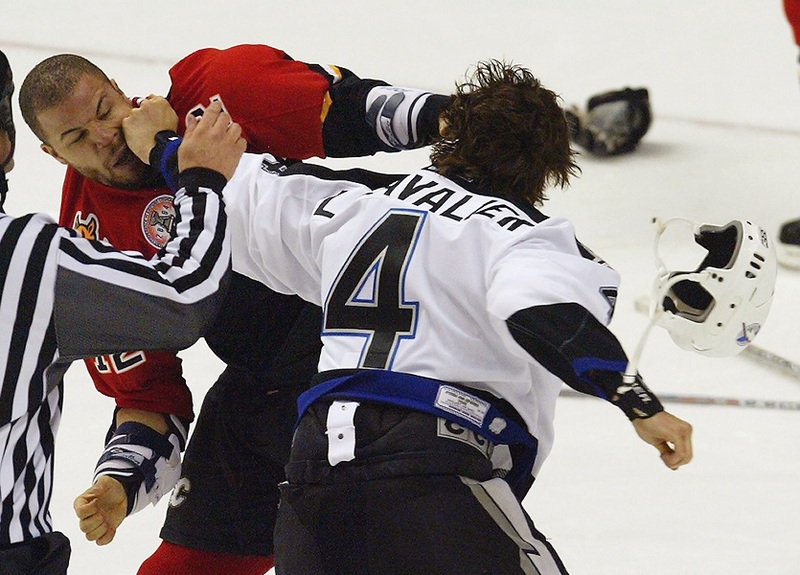 Although Iginla was the more experienced fighter, Lecavalier showed a natural adeptness to brawling and defeated his opponent. The victory rejuvenated the Lightning and brought the fight back to the entire team. Tampa Bay pushed the series to seven games and ultimately won the Stanley Cup, with players crediting Vincent Lecavalier as the reason. In 1991 the Philadelphia Fliers and the Washington capitals fought each other so much in one game it could be a list of its own. 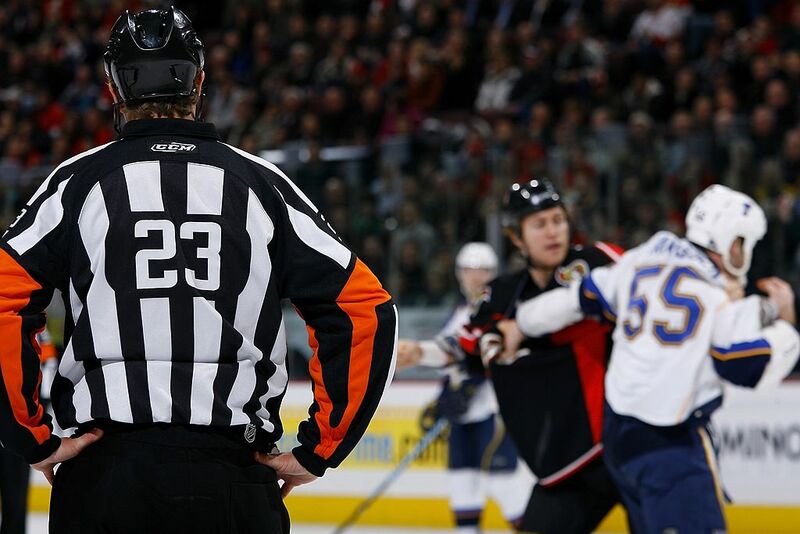 In total, the teams engaged in 21 fights resulting in 302 penalty minutes. For the record, there are only 60 total minutes in a hockey match. The first fight started after Dale Hunter landed a cheap blown on an opponent. Multiple melees followed. For those curious readers, winner for most fights goes to Al Iafrate, who found himself in five fights that fateful night. Unsurprisingly, the ugly brawl of a game led to a great rivalry between the teams and their fanbases. Over 20 years later the animosity died has died down but the memories will always remain. Next, we have two players that should never fight each other, but what position is it? 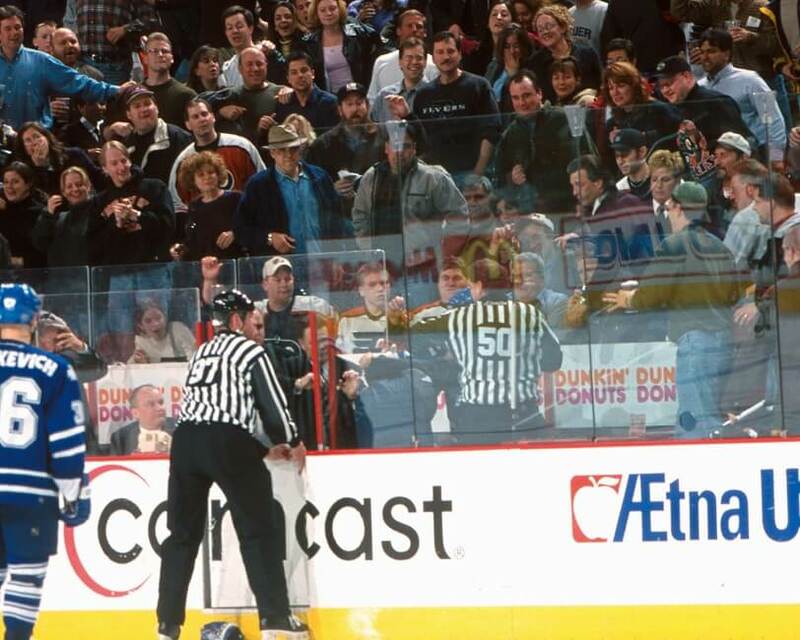 This classic brawl from 1998 stands out as one of the oddest in NHL history. Dan Cloutier was the goalie for the New York Rangers and Tommy Salo was the goalie for the New Jersey Islanders. The only time goalies should meet during a game is for handshakes before and after games. Somehow these two ended up getting into an epic fight on the line. 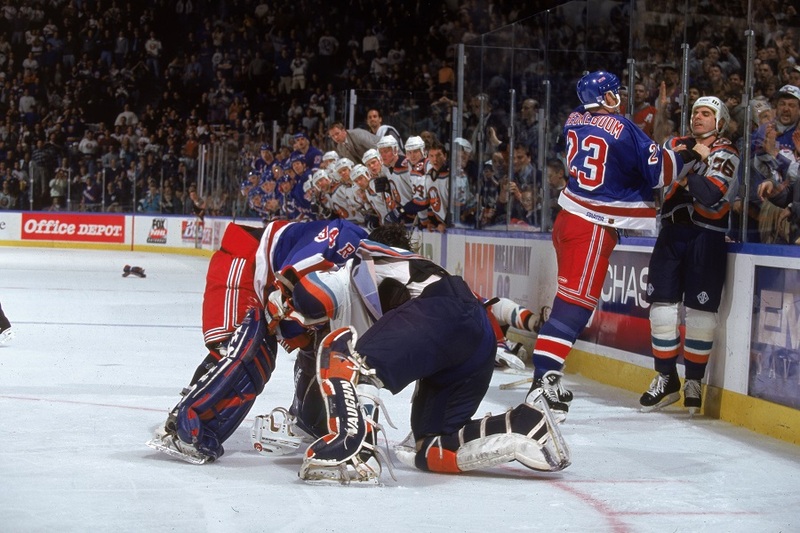 Cloutier started the fight, laying a wild beating on Tommy Salo before challenging the entire Islanders bench. No one took the bait, we’re guessing because they didn’t want to embarrass him. Then again, there is a chance they were scared. Maybe. Probably not. Wayne Gretzky may have been great at a lot of things, but fighting was not one of them. 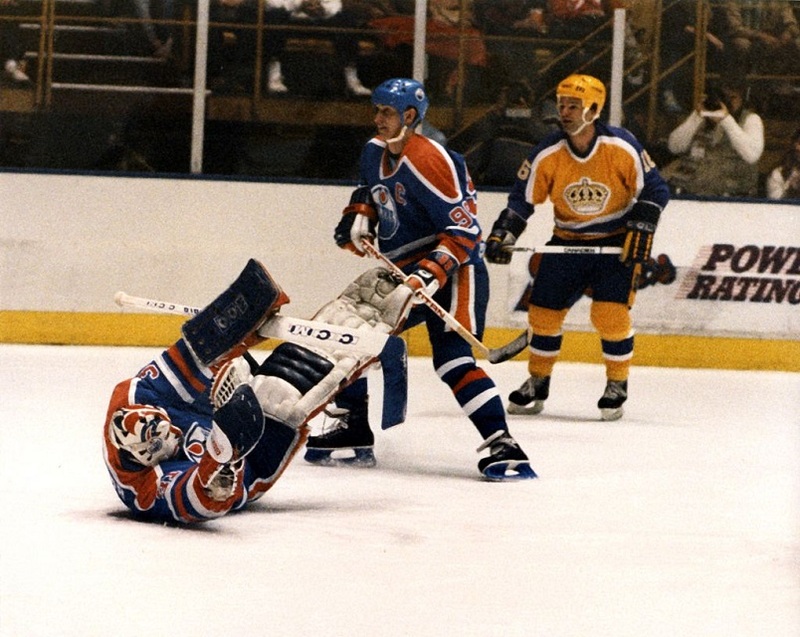 Still, no hockey list is complete without an appearance from the “Great One.” The fight we’re focusing took place in 1985 as Gretzky’s Oilers took on the Los Angeles Kings. Called for a high stick, Gretzky found himself in more than just penalty trouble when Kings’ captain Dave Taylor decked him in the side of the face. Gretzky immediately went down and the fight was over. Not to let sleeping dogs lay, Gretzky smiled while down on the ice, then went on to score the game-tying goal. There is, after all, a reason he’s the greatest hockey player of all time. Our next fight proves that chivalry, like Wayne Gretzky, is not dead. In January 2008 Krys Barch fought Brad May in what turned out to be the most respectable fight of the year. See, hockey players aren’t trying to hurt each other when they fight. It can even be argued they get paid to fight. After all, stats are kept for fighting and fans buy jerseys with their favorite fighters name on the back. Fighting is not about trying to hurt the other person in hockey, we promise. The proof is in the pudding. Before this fight started, Barch Warned May about a glove on the ice so he wouldn’t trip and hurt himself. Once the niceties were out of the way the pair laid punishing and appropriate hits on each other until the referees broke it up and penalty minutes were assessed. The fight was good, but the gentleman’s gesture before was even better! Dave Schultz and Tiger Williams are two the greatest hockey fighters of all time. Williams, to his credit, holds the record for most penalty minutes in history with 4,421. Dave Schultz, to his credit, holds the single-season record for most penalty minutes with 472. Having both these players active in the same era means they traded some punches with each other. This particular fight happened in 1976 and was started after Tiger Williams slashed Philadephia’s captain, Bobby Clarke. Schultz immediately dropped his gloves and went after the Maple Leaf’s big man. At one point Williams landed a blow to Schultz’s nose, but Schultz refused to give in. The fight ended in a draw, with both players tired. Our next fight ended with one team no longer in the NHL. Did you know the Colorado Avalanche used to play in Quebec as the Nordiques? Back in the 1980s the Nordiques had a feisty rivalry with the Montreal Canadiens. The Canadiens may have won the longevity battle, but Quebec refused to quit while they lasted. 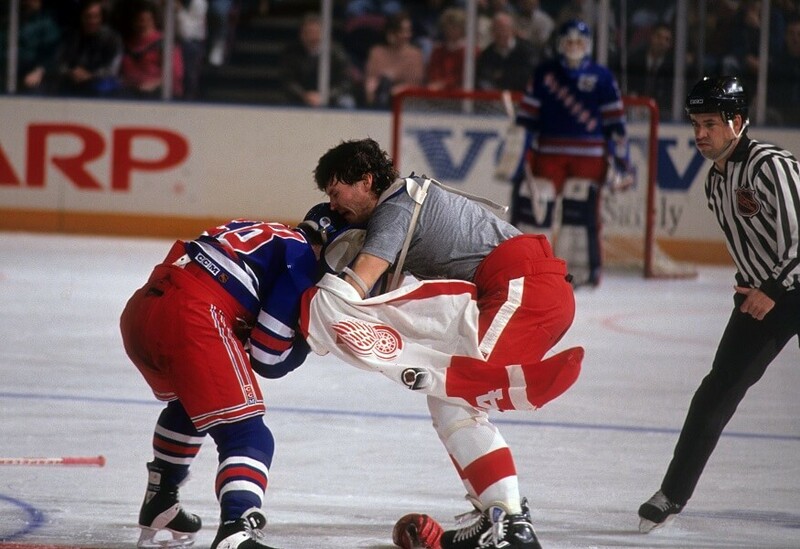 This classic fight between the two teams in 1984 saw a total of 252 penalty minutes handed out. As tempers peaked at the end of the second period, there were at least 14 fights going on. When the teams came out for the third period, they got right back to fighting like the second period never ended. After the game heat blanketed referee Bruce Hood for letting the game get entirely out of control. At the end of the season he retired, head hung low in shame. 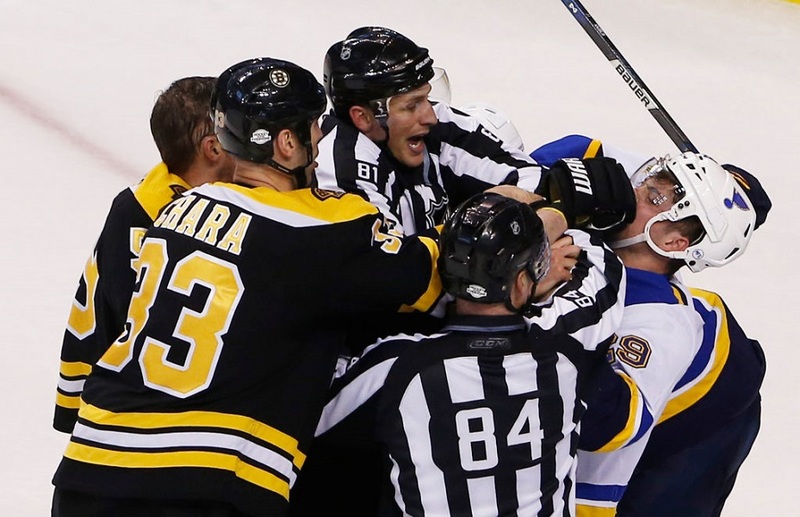 Sometimes it surprising how long referees will let hockey fights go on for. Like the fight above that cost a referee his career, or this one where the fight resembled a cartoon before it was stopped. On November 11, 1985, the Vancouver Canucks were playing the Detroit Red Wings when Bob Probert and Craig Coxe got into a boxing match. The two dropped gloves and threw punches back and forth for 40 seconds. And that’s not a joke. Watch the fight, both players literally become human “Rock ’em Sock ’em Robots.” The cartoon fight was eventually stopped, but the childish image will be burned in our hockey-loving brains forever! This fight should have been stopped before it ever started. Meeting each other at center ice during a face-off, the gloves dropped as soon as the puck did and these two got into it. The fight didn’t last very long once Tony Twist socked Rob Ray’s mask off. His fists of fury didn’t stop until Ray was bloodied on the ground with the referees holding him back. The beatdown sent Rob Ray to the hospital, where he was diagnosed with multiple facial fractures. Twist was known as a fighter and Ray should never have challenged him. Perhaps Twist was such a prizefighter because he name was taken seen as such a joke. We may never know, but it is fun to guess! Taking place on April 17, 1980, this awesome 50-second masterpiece is second to none when it comes to hockey fights. 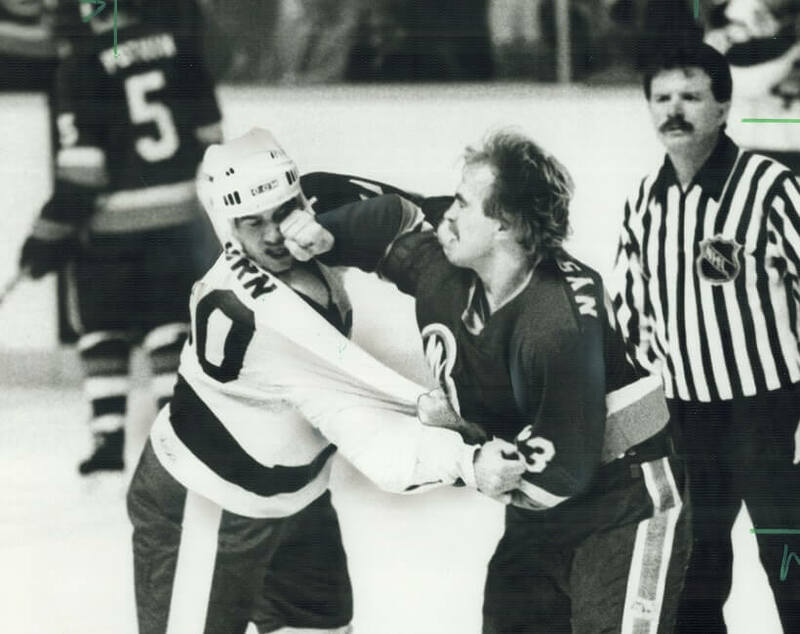 There was no love lost between Bob Nystrom and John Wensink when they traded punches on that fateful night. What’s most refreshing about this fight is just how simple it is. Neither player tries to tackle the other or rip their jersey off. They just fight. Something one of them did during the game pissed the other one off and gloves were suddenly, and excitingly, no longer necessary. Once the fight was over, both teams got back to what was really important, the game! Fighting has changed over the years in the NHL. It’s always been a part of the sport, but now it’s a part of players’ paychecks (see the previous slide). 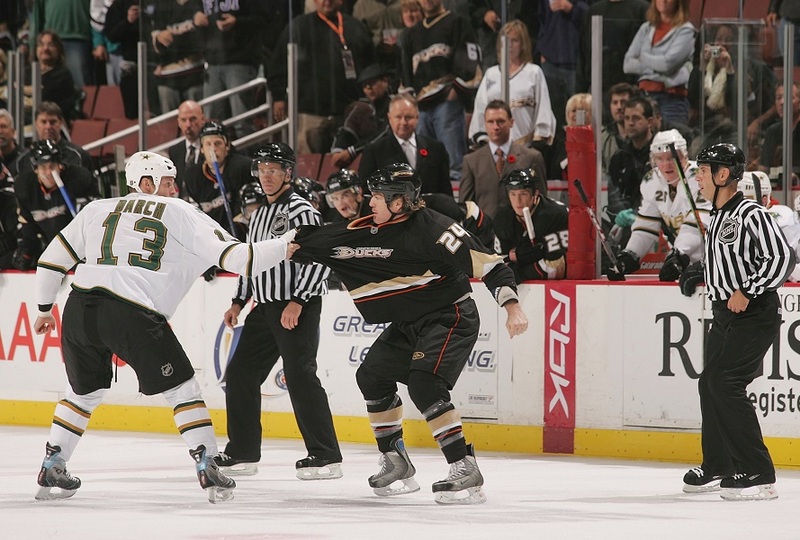 Modern hockey fighting is more like boxing, with players gesturing and blocking, hoping to land a few good punches before being sent to the penalty box. 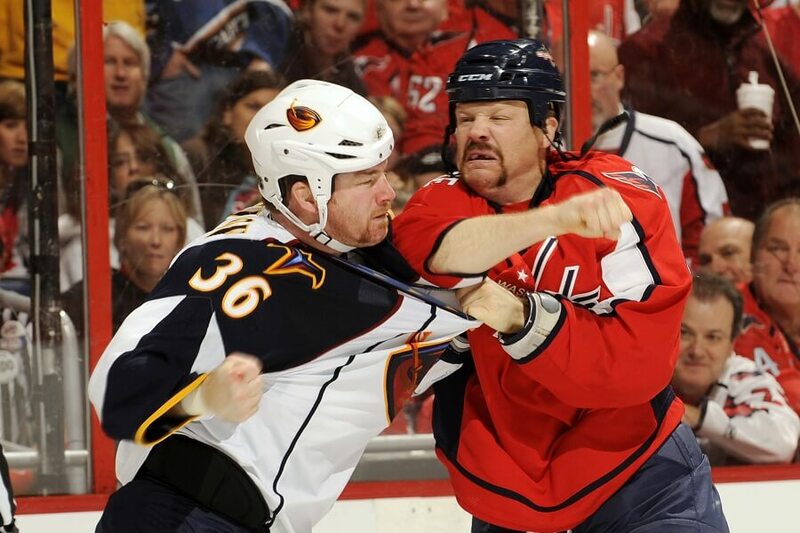 This fight between Erik Goddard and Brian McGrattan is the perfect example. Neither player lands a high percentage of punches, choosing instead to swing semi-wildly before quickly getting back into a defensive position. Now, if Marty McSorley or Bob Probert had been involved in this fight you can bet things would have played out a whole lot differently! Our next fight would have ended differently with David Koci was bigger. Zdeno Chara spent his NHL career looking more like a mountain than a player. David Koci, despite his smaller stature, just didn’t care on the night of October 25, 2007. Playing the match with a broken nose, Koci decided it was a good idea to take on Chara. He landed a few good punches, earning our respect, but he also learned rather quickly his rash decision was a terrible one. At the end of the fight, Koci was covered in his own blood, exactly how the logical side of his brain must have imagined the fight going. Hopefully, the few punches he landed filled him with enough pride he was able to sleep that night. Nearing the end of our list it’s time to really peak your interest. Did you ever think a referee would allow himself to be egged into a fight? On April 4, 1998, that exact scenario happened. Trying to break up a fight between two players no one remembers, referee Mick McGeough snaps, grabbing the jersey of Darcy Tucker and yanking him backward. He finishes Tucker off by pushing him into the Tampa Bay Lightning’s bench. The classic moment must have come at a huge shock at the time. After all, referees aren’t called zebras for their testosterone-fueled aggression! The last fight on our last will prove our point. 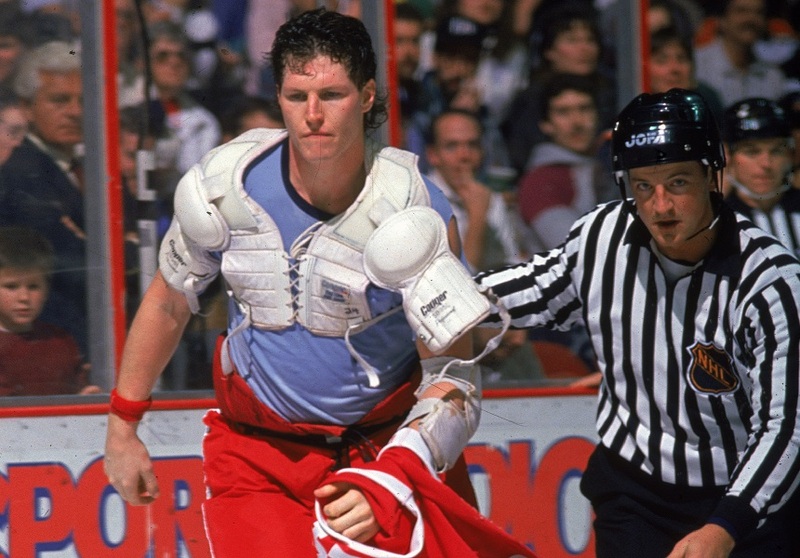 Here we present you two heavyweights on this list: Bob Probert and Marty McSorley. What makes this fight from 1994 so unique is that Probert seems to win. Don’t forget, McSorley was a such a good fighter he ended his career swinging! The fight starts out innocently enough, with both players grabbing jerseys and throwing punches. McSorley manages to get Probert’s jersey off pretty quickly, and that moment is when things get out of hand. Probert doesn’t quit. He just keeps swinging, eventually knocking McSorley’s helmet off. You may be asking yourself what the referees are doing at this point. Surprisingly they are doing their job and just can’t find a punch free zone to break up the brawl. Up next, let’s talk about goalies again! 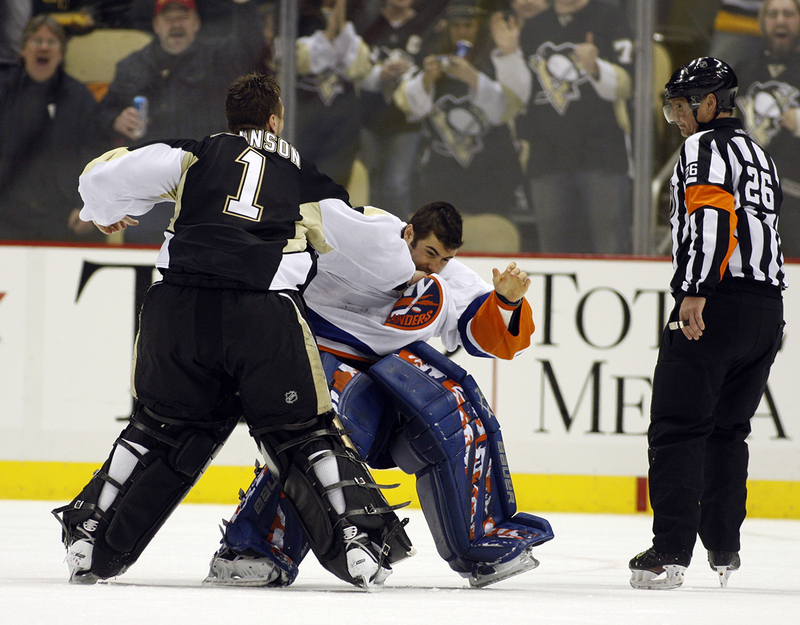 On February 11, 2011, the Pittsburgh Penguins faced the New Jersey Islanders and a fight so quick happened you might have missed it if one player involved wasn’t severely injured. Coming off a small fight on the boards, Islanders goalie Rick DiPietro glides out to center ice and challenges Penguins goalie Brent Johnson to a fight. Johnson accepts the challenge and meets DiPietro, landing a number of blows instantly. DiPietro goes down, eyes swollen and bloodied. With the fight mercifully over, DiPietro retires to the locker room where he is diagnosed with a broken eye socket. Ultimately DiPietro’s urge to fight lead to the downfall of his career. Let that be a lesson about getting into pointless fights, kids! 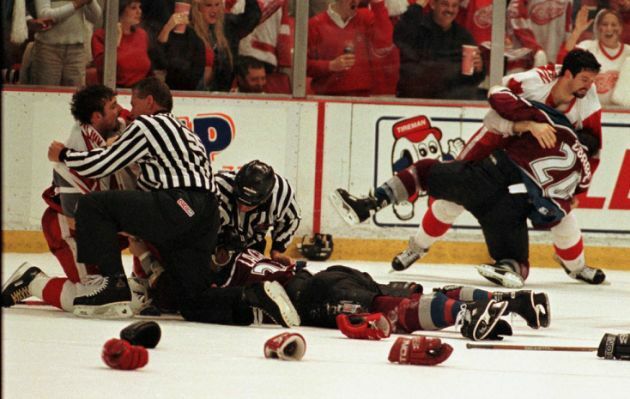 Known lovingly as “Bloody Wednesday,” this team-on-team brawl saw the massive 1990s rivalry between the Colorado Avalanche and Detroit Red Wings reach its tipping point. The feud started during the year prior to game three of the Western Conference Finals when Avalanche enforcer Claude Lemieux punched Slava Kozlov in the jaw. The Red Wings waited in the… wings… and struck back a year later. 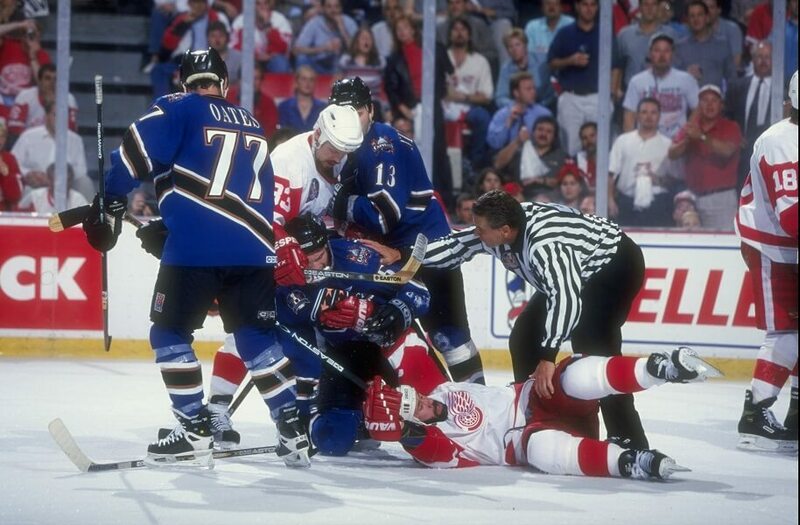 The next March, Darren McCarty punched Lemieux, almost knocking him out. The rest is history as multiple players from both sides got into one of the most epic hockey fights of all time! You just have to watch the video for yourself to really appreciate it. Words don’t do it justice. The San Jose Sharks are known around the NHL as soft and great at choking in the playoffs. In 2012 the team was tired of the unfortunate reputation and took their aggression out on the St. Louis Blues. After a brutal 3-0 shutout, the Sharks turned the arena into a boxing ring. The final buzzer rang out and San Jose’s bench emptied, not realizing it was their own blood in the water they were smelling. Defenseman Douglas Murray started the fight, and it didn’t take long for the team join in. Even players not known as fighters, like Justin Braun, landed a few good blows. 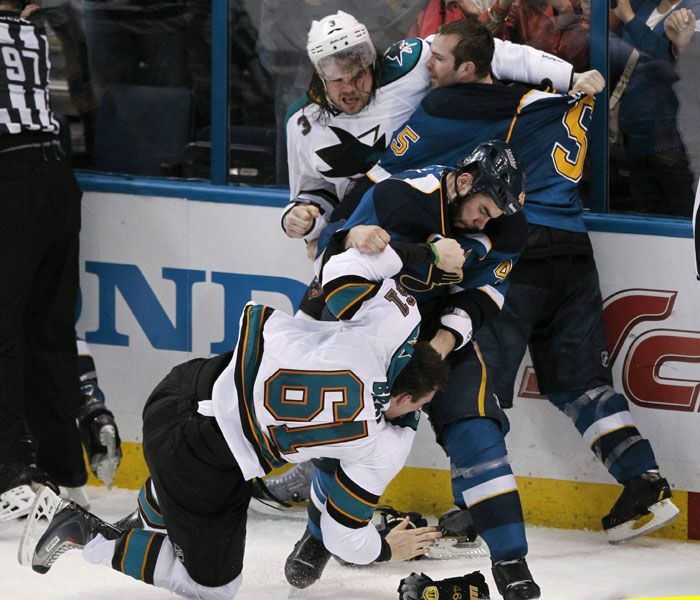 The fight ending up sparking the Sharks, who wound up winning the Western Conference. This epic fight from 2003 saw the Flyers’ Donald Brashear take on the Maple Leafs’ Tie Domi in the first round of the playoffs. Winning 4-1 with 10 minutes left in the game, Domi challenged the big man to a fight. Five inches taller than Domi, Brashear accepted the challenge and both men dropped their gloves. Despite the size difference, Domi unleashed a fury of punches that ultimately gave him the “W.” Of course, winning a fight is not the same as winning the game, which the Maple Leafs were not able to do. This infamous fight turned an ugly game even uglier. Having given up six goals to the Boston Bruins, the Washington Capitals were having trouble keeping their emotions under control. Looking to light a spark, Stephen Peat jumped on the ice and starting hunting down Bruins to fight. Peat got his wish when P.J. Stock lined up against him. Known as a career fighter, Stock dropped his gloves and the pair began exchanging savage blows. After 30 seconds refs were able to break up the fight. Both men headed back to their benches, open wounds bleeding profusely. More than two players were left bleeding after our next fight! When the Chicago Blackhawks played the St. Louis Blues on St. Patrick’s Day in 1990, the world was given the “St. Patrick’s Day Massacre.” The team on team fight began after Chicago’s Jeremy Roenick hit Harold Snepsts. Glen Featherston then shoved Roenick to defend his teammate. Featherston’s hit was the last straw, and both teams met at center ice to knock each other’s teeth out. 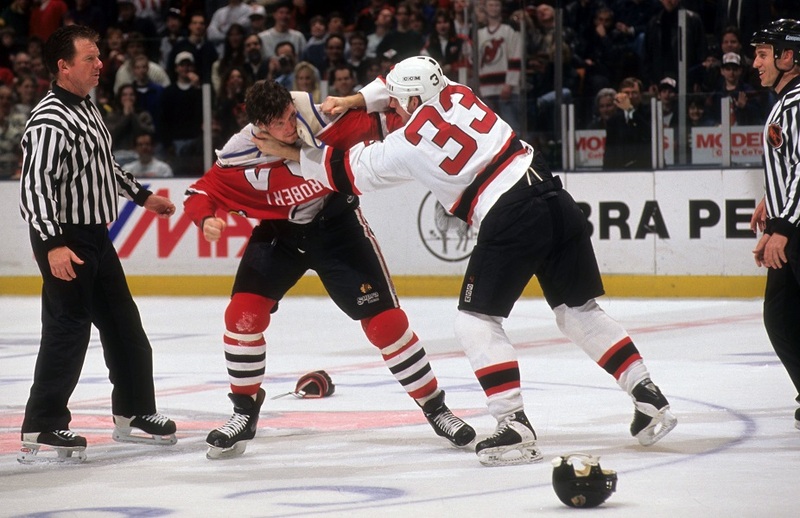 Blues enforcer Scott Stevens was involved in three separate scuffles during the mayhem, including one with Dave Manson. After the fight, 12 players were ejected and 278 penalty minutes were handed out. A little backstory before on the fighters in this fight. 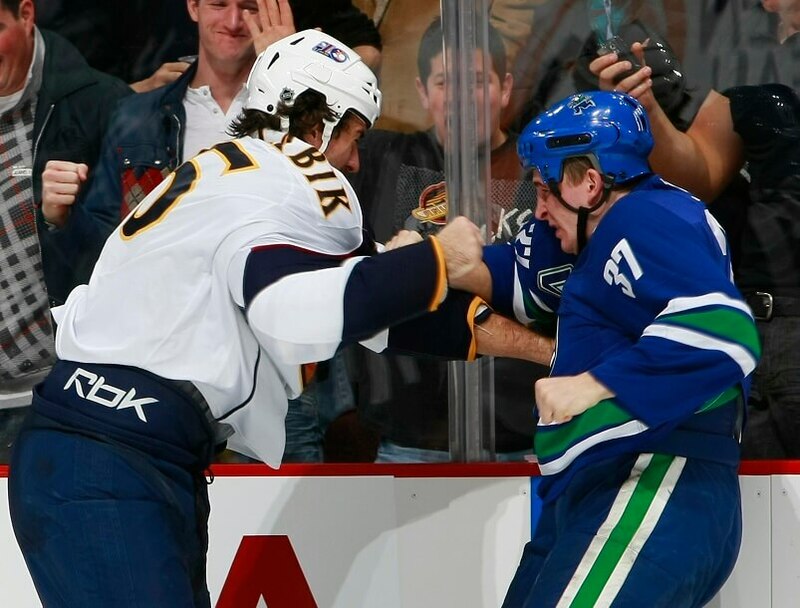 Before fists were thrown, Matt Johnson had 122 NHL fights to his scorecard and Andrew Peters had 12. Johnson had been in the league eight seasons. Peters had been in the league for 17 games. The young rookie never stood a chance. The two met at center ice and Johnson unloaded on Peters, grabbing his jersey and landed a devastating series of blows. Peters, to his credit, refused to quit and kept getting back up after each hit. Eventually, Johnson landed a blow that knocked Peters down and kept him there for good. A preseason fight gone horribly wrong, this bout between Nick Kypreos and Ryan Vandenbussche ended one of the careers. Both men fighting for jobs, they dropped gloves mid-match to prove their worth. Vandenbussche, a rookie at the time, landed a vicious punch early in the fight, sending Kypreo to the ice. As Kypreos laid unconscious on the ice, a puddle of blood started to form under his face. He didn’t die, but his NHL career did. After eight years in the league, Nick Kypreos never played another game again. Ryan Vandenbusche would go on to play fifteen seasons in the NHL for multiple teams. Another appearance for Bob Probert on this list, this scrap he managed to get into is one of the best. 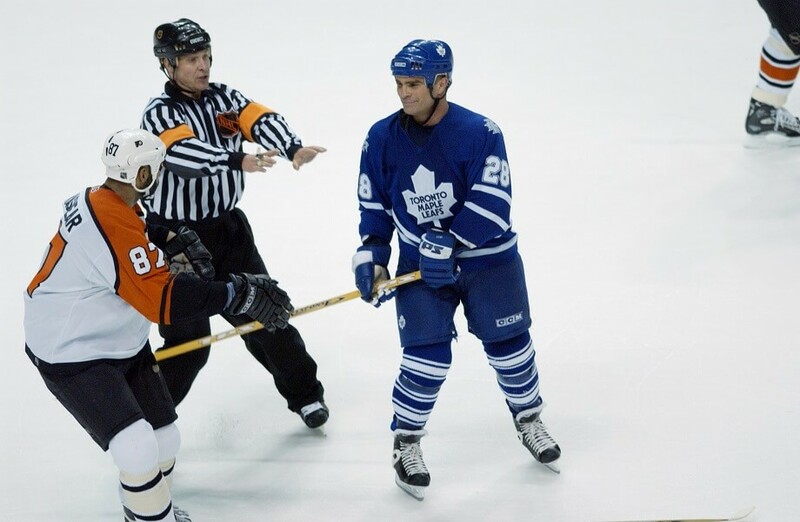 Getting a chance to fight Tie Domi, the pair exchanged blows for 60 seconds before the fight was broken up. By some counts, 70 punches were landed. It’s amazing both players walked away unharmed! This was actually the second time the pair fought each other, but it was also the best. After their first meeting, a friendly rivalry was formed, and this fight was the first chance they had to meet back at center ice and work through their differences. Not a career-ending blow by any means, this one punch fight is one of the most exciting of the last 20 years. Playing Carolina, Downy challenged Jesse Boulerice to a fight. Boulerice, thinking he would use the element of surprise, charged Downey and tried landing a punch. Downy ducked, then countered with a destructive blow of his own. Boulerice fell to the ice and did not get back up. 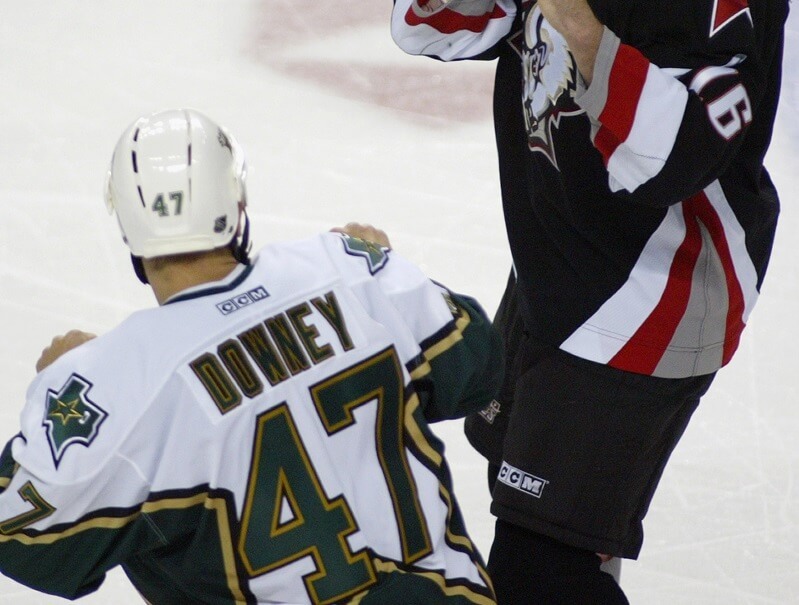 Unlike Kypreos, Boulerice was able to continue playing hockey after the fight, he would just think about fighting Downey again the next time they would meet. Six minutes into a 1978 Stanley Cup Playoff bout between the Boston Bruins and Montreal Canadiens, tempers boiled over and a big fight occurred. 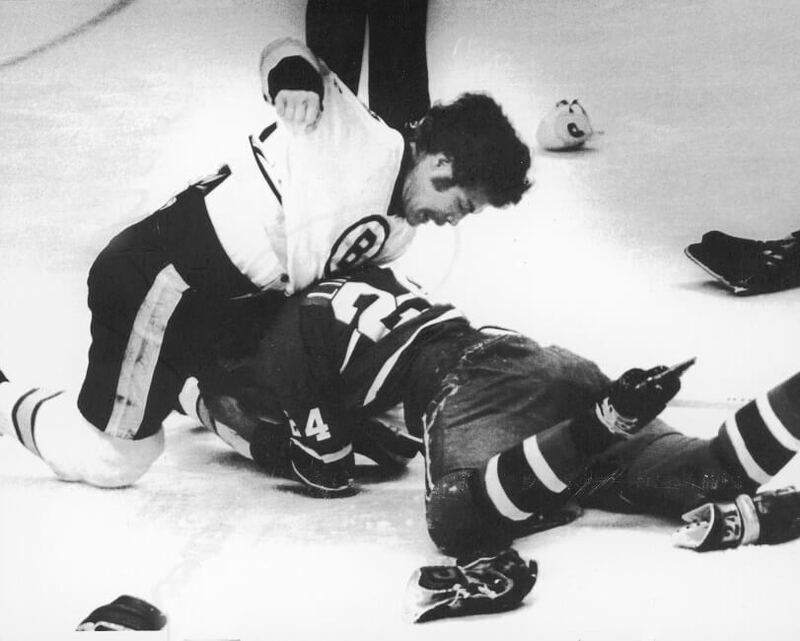 Bruins’ enforcer Stan Jonathan met Pierre Bouchard found each other at the blue line and unleashed a lighting storm of punches at each other. After separating for a brief moment, Jonothan landed a blow that caused a sea of blood to flow from Bouchard’s face. The fight was eventually broken up by teammates, one of which found himself covered in Bouchard’s blood, for better or for worse. Surprisingly, this is one of the few hockey fights which has resulted in one player wearing another’s blood. No blood was poured in our next fight, but that doesn’t mean it wasn’t brutal. This classic fight from 2010 took place between Eric Boulton and John Erskine. The two behemoths squared off on that fateful day in November determined to beat the other senseless. They somehow both succeeded and by the end of it hockey had been handed an all-time classic fight. 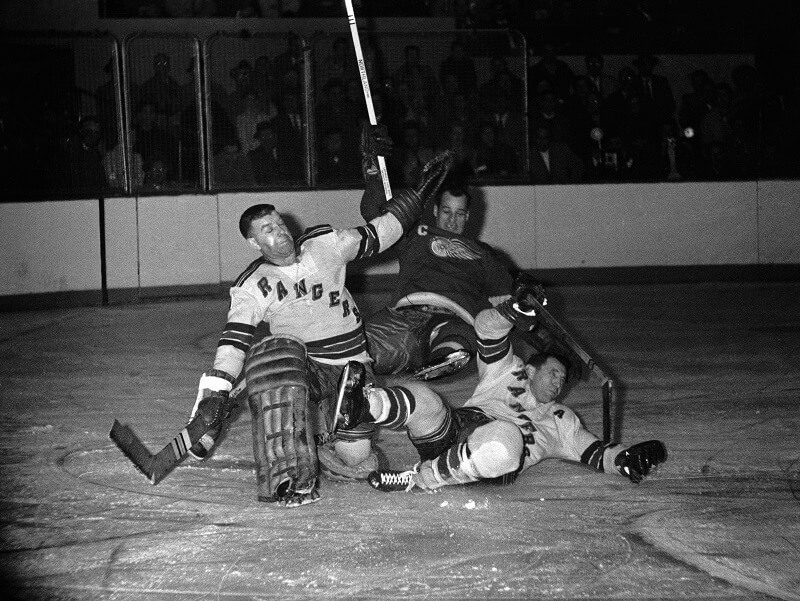 It may have been 1959, but that doesn’t mean hockey was any less brutal. 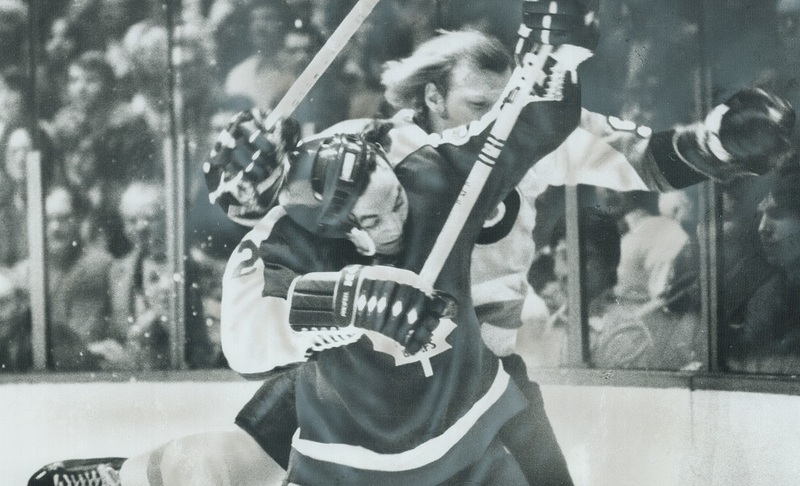 This fight took place between NHL legend Gordie Howe and Lou Fontinato. A few minutes into an Original Six matchup, Fontinato lined up against Howe and learned the hard way that Gordie was no slouch with his fists. Howe unleashed fury on Fontinato, who wound up in the hospital with a broken nose, a dislocated jaw and a very bruised ego. Howe, for his trouble, ended up with a few dislocated fingers. It was probably worth the pain to prove his dominance over an opponent, though. This fight lasted only 22 seconds, but the impact of each blow lasted much longer. 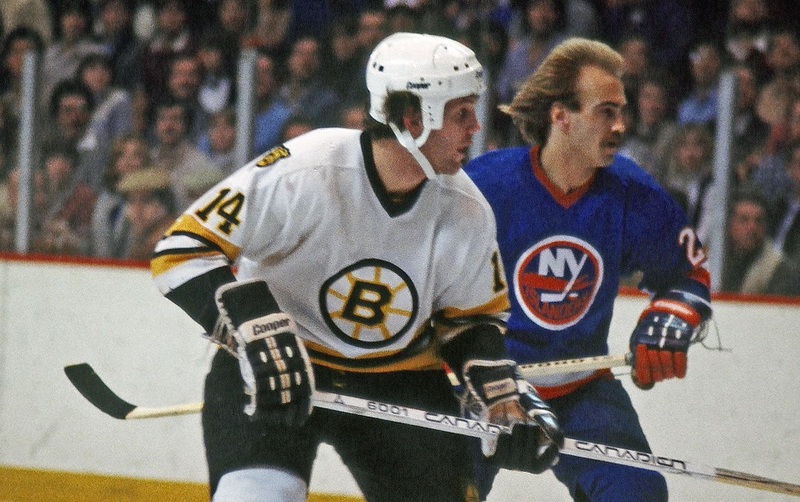 When Bob Nystrom fought Mel Bridgman in 1978, the world was treated to much more than just a hockey fight. From the intensity of the moment, it looks like these two men just did not like each other. Brutal blow and brutal blow is landed in under 30 seconds. The referees aren’t quite sure how to get in and break the fight up earlier than that. Who knows what would have happened if the fight was not broken up, though! One of the two men surely have lost some teeth! The most entertaining part of a larger fight, this matchup between goalies really tests the strength of their pads! During a matchup between the Toronto Maple Leafs and the Philadelphia Flyers in 1996, no love was lost when Felix Potvin and Ron Hextall met at center ice. The punches that land are so brutal that after each goalie has had enough, they grapple each other. Who knows what they’re talking about in that scrum, but the referee does a nice job reassuring both men everything will be okay in the end. There was no hugging at the end of our next fight. Or during! On February 19, 1984, Jamie Macoun fought Ron Delorme in one of the oddest fights in NHL history. While most hockey fights remember boxing bouts, this fight looked more like a street brawl, both men preferring to land punches than block them. That’s right, not a single punch was blocked! It’s incredible both men walked away from this fight without serious injury. Then again, both men had plenty of time to brace themselves with the epic staredown that took place before the fight! The referee even has time to stand next to them and try and talk them out of beating the snot out of each other! 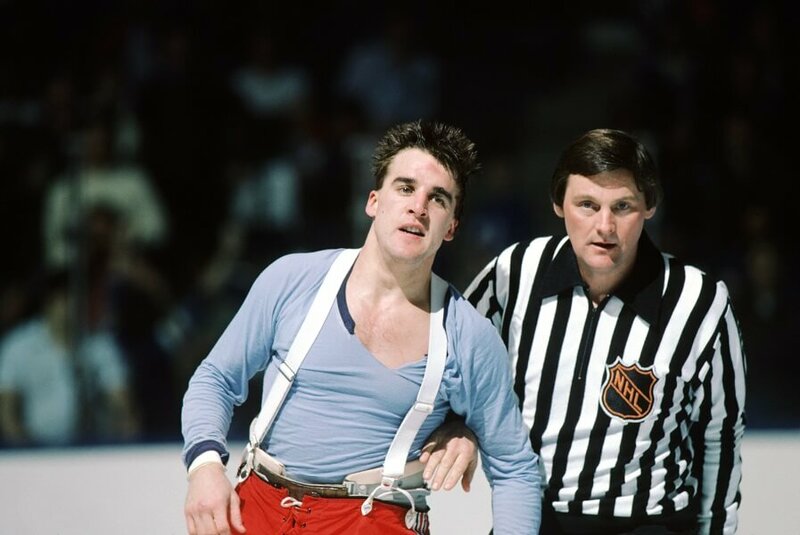 The year was 1986 when Goerge McPhee, weighing a feeble 180 pounds, decided getting into a fight with 220 pound Rick Tocchet was a good idea. Despite the clear size difference between the two men, the fight is actually a pretty even stalemate. The undersized McPhee shows how scrappy he is, jumping up and landing blow after blow. The fight finally comes to an end when both men fall to the ice, holding on to each other. At this point, the referees are able to jump on the pile and subdue the fighters. 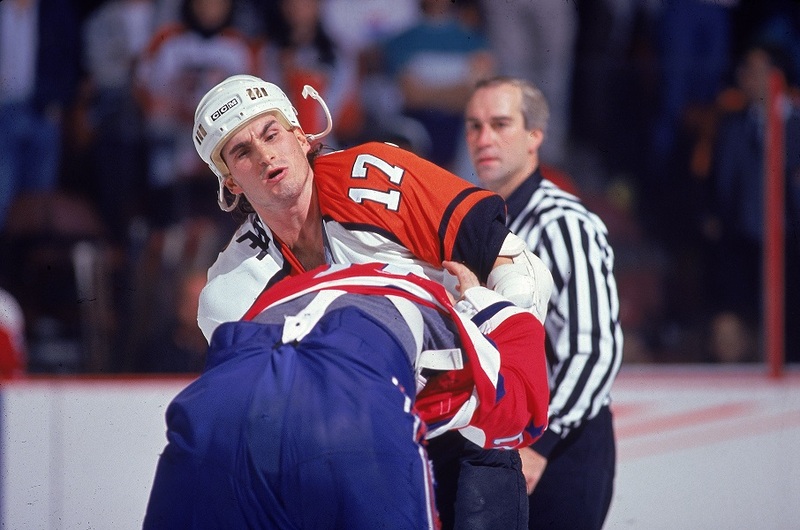 Who knows what George McPhee was thinking taking on someone 40 pounds heavier than him, but we’re sure grateful he did! Another fight that never should have started, Hal Gill just couldn’t help but get into a fight with the mountain known as Zdeno Chara in 2003. Maybe because Gill was a similar size to Chara he thought he stood a chance. Whatever Gill thought was going to happen, boy was he wrong. When the men meet at center ice, they instantly tangle jerseys. Zdeno gets right to work, landing deadly blow after deadly blow. Gill tries to punch back but doesn’t come close to having the same reach Chara does. Ultimately, Chara knocks Gill to the ground, asserting his alpha male status in the NHL. Next challenger! Chris Falcone took his fandom of the Philadelphia Flyers to the next level in 2001 when he jumped into the penalty box to fight Tie Domi. Doing what hockey fans do, the skirmish started innocently with Falcone trash talking Domi over the side of the box. When he fell in, all hell broke loose! Domi grabbed Falcone and threw punch after punch until the referee was able to separate them. For his part in the brawl, Domi had to pay a heavy fine from the league. He made right with Falcone after, though, paying for him to attend multiple playoff games with his family. The final fight that took place at The Aud, the former home of the Buffalo Sabre’s, was one for the record books. The fight was short, about as short as this sentence. The punches thrown by both men were fast furious. 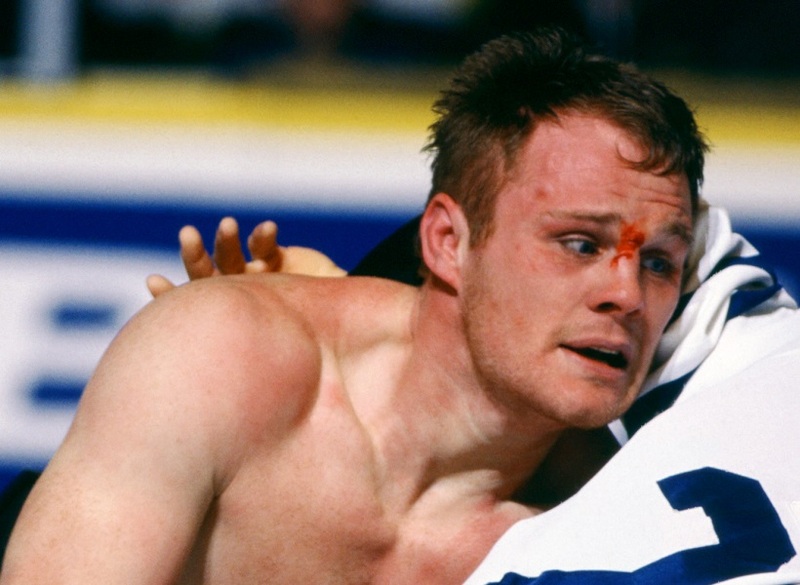 In the end, Rob Ray was the victor, leaving Dennis Vial bloodied on the ice. These two men really did not like each other. What the fight lacked in length in made up for in intensity. It really was a treat for fans who paid good money to watch the game. Vial probably spent good money fixing his face afterward too! 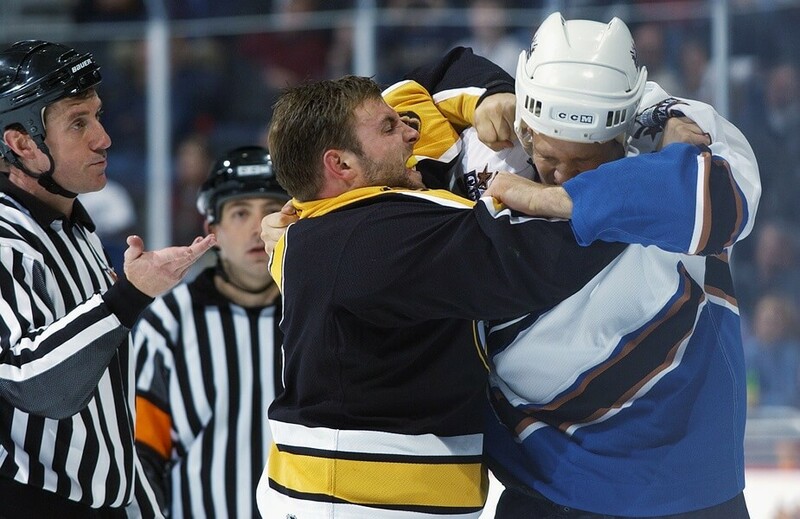 When David Clarkson fought Steve Downie in 2008, a modern day classic brawl took place. Downie started the fight, egging Clarkson on. When Clarkson finally engaged him, Downie kept his visor on and allowed blow after blow to land, laughing after one. 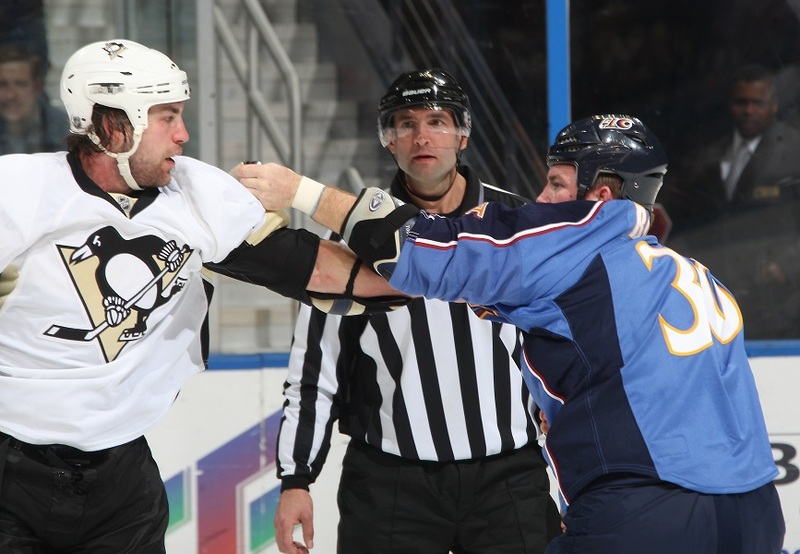 Downie returned a fair number of blows as well. The referees tried multiple times to separate the two, succeeded twice only to see them re-engage. By the time the fight was finally over, Clarkson had a dark streak of blood running down the side of his face and Steve Downie was being congratulated by teammates. Ryan Rypien was undersized for a hockey player at 5’11” and 184 pounds. He loved to fight, though, getting into over 90 in his career. One classic was against the six foot tall, 210 pound Cam Janssen. It’s not very clear ho this fight started, Janssen just skates past Rypien, then stops and throws his gloves off. 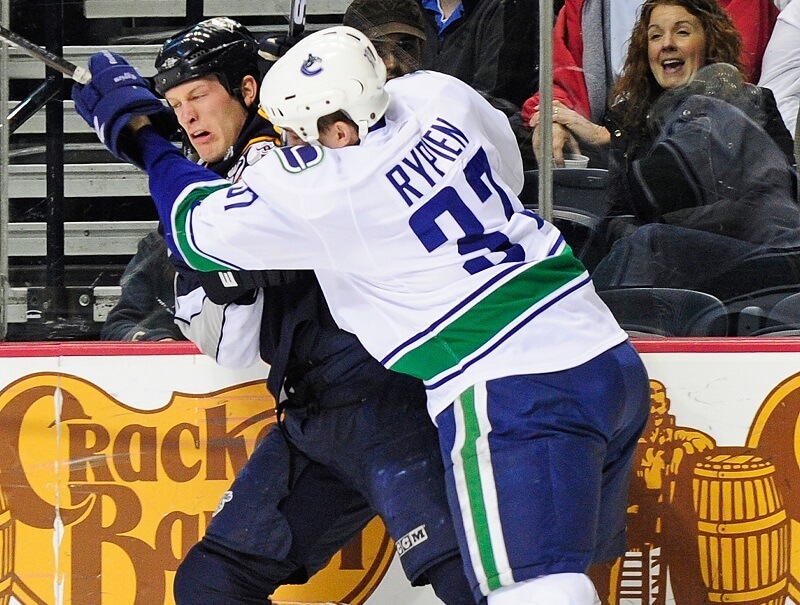 Early in the bout, Rypien loses his helmet, but he lands so many punches that protecting his face doesn’t matter. When the fight is over, both men have bloody faces and enter their penalty boxes satisfied with the damage they did to each other. Next, enjoy one more Rypien fight! Taking on another behemoth, this fight saw Ryan Rypien goe toe to toe with Boris Valabik. Valabik should have easily won, having eight inches and 50 pounds on Rypien. Rypien, who did nothing significant in his NHL career except for fight, found a way to get the upper hand, proving that size really doesn’t matter. The fight is very short, Rypien works his way under Valabik, then pulls his jersey over his head and pounds him relentlessly. The fight ended thunderously, however, with Rypien skating away unharmed to the penalty box with a standing ovation. 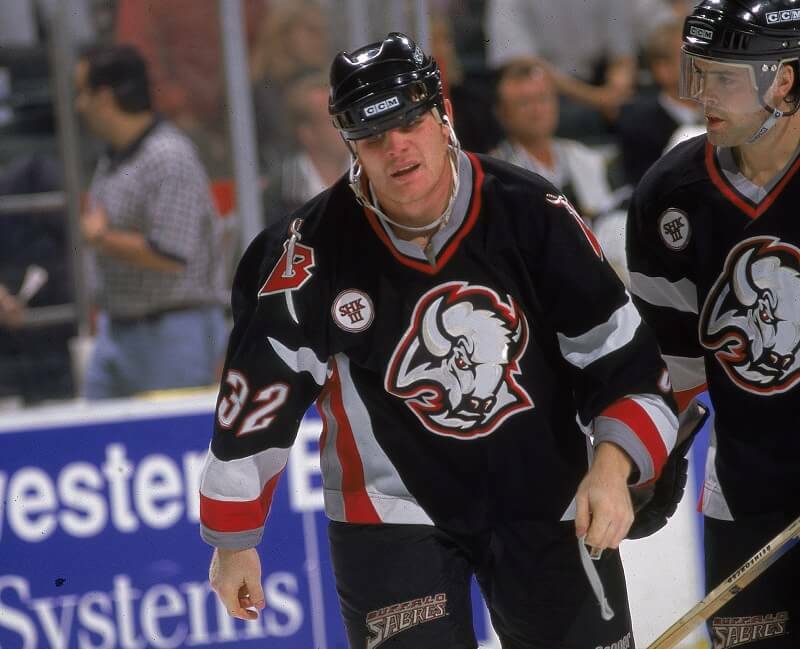 Sometimes the best things come in twos, which is why Marty McSorley lands himself on our list again. 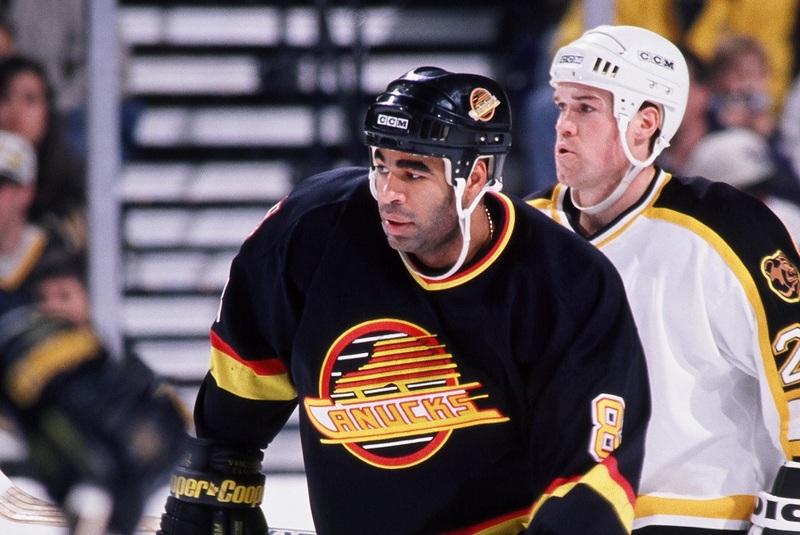 This time the bout came against another of the NHL’s top enforcers, Donald Brashear. On February 21, 2000, the pair got into a minor fight at the start of their game. After beating McSorley early, Brashear taunted his opponent, letting him know just how easily he won. McSorley responded with a crosscheck resulting in a 10-minute penalty. Brashear then “fell” on the goalie, injuring his knee. At the end of the game, McSorley slashed Brashear in the back of the head. After the game, the league decided enough was enough and suspended McSorley indefinitely. Brashear and Vancouver then decided to press charges and McSorley never played again. Our final fight has one of the odder stories behind it. On January 6, 1998, Mark Tinordi and Jason Smith got into a fight that should have never happened. The fight actually began between Tinordi and a different player. It wasn’t very exciting or interesting. Jason Smith, over-hyped on adrenaline, jumps in and starts wailing on Tinordi like a tornado. If you watch the video, though, Smith would have never gotten close to Tinordi if the referee had stopped the fight shortly after it began. Instead, he stands in the background, crosses his arms, and enjoys the free show. Get that man some popcorn because his entertainment is somehow more important than his job!